A”Missing Child Alert” has been issued formissing 3 year old Meliek Simmons, who was last seen on Saturday, June 26, 2010 in Orlando Florida. Meliek Simmons is considered missing and endangered by police and is suspected as being in the company of his uncle, 49 year old Calvin Reed. 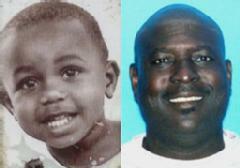 The 3 year old Orlando boy was last seen at 1:00 pm Saturday afternoon at his home in Orlando. It is reported that Reed was babysitting the Simmons, but did not have permission to take him. Calvin Reed is said to share the Orlando home with the 3 year old missing toddler’s mother and maternal grandmother. Police are reporting that the two may be in a 1996 tan Sierra Oldsmobile with Florida tag W46 1PK. The Florida Department of Law Enforcement has issued a missing child alert for a 3-year-old boy last seen Saturday in Orlando. Authorities said Meliek Simmons may be in the company of his uncle, Calvin Reed, 49.